has drawn just about every major Marvel and DC character at some point in his amazing career- a good friend and great talent. 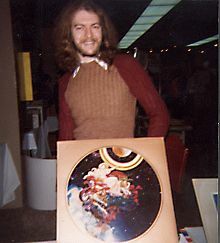 first amazed fans with Conan for Marvel, then went into the fine arts collective with Berni Wrightson, Mike Kaluta and Jeff Jones called "The Studio". 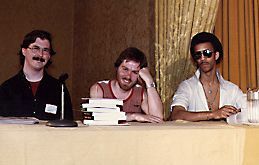 TOM ROGERS (journalist) and DENYS COWAN (comic book creator/illustrator) strike a fun pose on one of the many comic book storytelling panels held over the years. has been bringing his classic sense of illustration to comics since Secret Agent comic strips 50 years and his amazing EC legacy still shines today with the best of them. 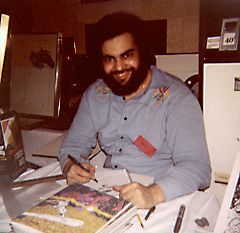 His brilliant pen and ink craftmanship was perfect for Flash Gordon and so many others. a prolific comic creator who codeveloped the New X Men with Chris Claremont, shares a moment with CARL POTTS, who created Alien Legion (now optioned for feature film). 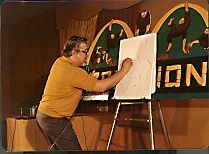 a comic book master, gives an illustration seminar at a Creation Comic Book Convention in the Seventies. (left) is considered one of the finest fantasy painters of our time. At one time his art collective: JONES, WRIGHTSON, SMITH, KALUTA: THE STUDIO was one of the shining lights in graphic storytelling arts. ROBERT GOULD (right) also is an outstanding fantasy illustrator who has won numerous awards for his visionary work. gone but not forgotten, the beloved Bridwell was a fixture at Seuling and Creation comic events of the early seventies. 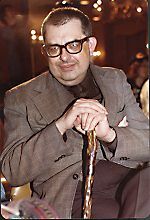 With an eccentric speech mannerism and a brilliant command and knowledge of all things comic book, Nelson was a fan favorite and a treasured DC Comics resource until his untimely death. 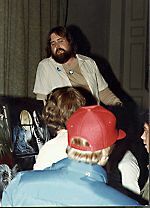 surely the God of comic book illustrators, most revered legend who cocreated the Marvel mythology with Stan Lee and is responsible for hundreds of incredible comic book characters, was a treasured guest at several Creation events until his unfortunate passing. Jack never really got to see the extent of his impact on media and entertainment, but if he were around now, he'd smile, seeing what's become of the Marvel universe. LONG LIVE THE KING! 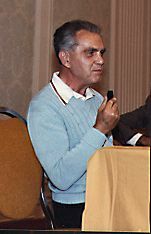 was a fixture at Creation comic events for many years, and a fan favorite for his great work on Iron Man and Hercules amongst others. was one of the first comic creators to bring the graphic novel format to comics. is an outstanding illustrator and storyteller, having such notable career achievements as Elektra: Assasin with Frank Miller and numerous gorgeous painted and mixed media covers for comics and books. is currently Editor of the Batman family of DC comic books - way to go Bob! He was formerly with Dark Horse Comics, and before that, a Creation staffer. And before that, lead vocalist of Pellucidar, the Edgar Rice Burroughs-inspired rock band that performed at several Creation events in the late seventies that featured smoke breathing dinosaurs. is the inker's inker, surely one of the best purveyers of pen and ink technique. 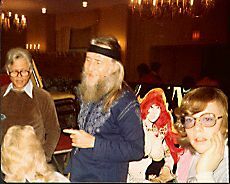 one of the heads of DC Comics- enjoys an appearance at our 1987 NY Thanksgiving event. Creation ran shows in a lot of New York properties down through the years- remember the "Omni Park Central"? creator of Blade and renowned comic book and tv writer, is currently based in LA where he is developing both TV and comic book projects. JOHN BUSCEMA, another comics heavyweight. was a revolutionary force in comics at Marvel, and also pioneered the short lived Broadway sci fi play WARP. is one of fandom's most reknowned painter-illustrators, and he has done the covers of countless books and magazines. In a class by himself. one of the Studio men, his brilliant comic book storytelling and art remain hugely popular with his legion of fans. WENDY PINI, co-creator of Elfquest, in her Red Sonja costume that she wore while frequently appearing with Sonja writer Frank Thorne. was one of the most gifted fantasy and comic book illustrators and did some amazing work for EC Comics. is a fan favorite, comfortable with both pencil, pen and ink and painting media. His self published works were some of the earliest Graphic Novel formats. 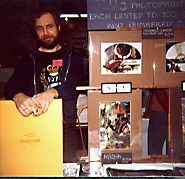 Frank allowed us to print several of his beautiful paintings on the covers of our INFINITY fanzine back in the early fandom days. was Editor In Chief of Marvel Comics before moving on to form his own company. Today he oversees a line of characters. 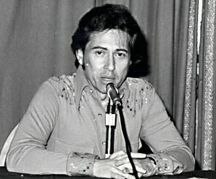 JIM STERANKO was our first guest, at our very first event in 1971 at the New Yorker Hotel. Jim was one of Marvel Comic's true geniuses during the Marvel explosion of the late sixties- early seventies and he particularly left his mark on the Nick Fury series which demonstrated his incredible graphic storytelling ability. Jim would write and draw those stories, first in Strange Tales and then Nick Fury comic, and created a number of innovations including the 4 page spread! Jim inspired us in our youth and was a wonderful guest speaker. He also freaked us out by proposing to do a Houdini-style gag while dangling by a chain from a helicopter above the 18th floor roof of the Statler Hilton a couple years later...although we wisely opted against it he could surely have pulled it off. Jim went on to publish the much loved Prevue magazine for several years, and he continues to paint for book covers. One of our favorite people, he also appeared for us last year in honor of our 30th anniversary. 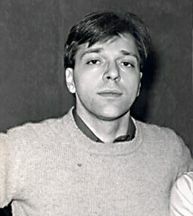 HOWARD CHAYKIN is a comic revolutionary, having done work for independant publishers like American Flagg as well as great graphic novels like Empire. He shifted his arena to television, but his comic work is highly regarded. Howard was an enjoyable and accessible guest.